Hey Divi Nation! Thanks for joining us for the next installment of our weekly Divi Design Initiative; where each week, we are giving away two brand new, free Divi Layout Packs from our design team to you. For the first layout of the week, Kenny and his team have created a captivating Animal Shelter Layout Pack. This pack has eight different pages included, each with an alluring combination of warm colors and heart-stirring images. 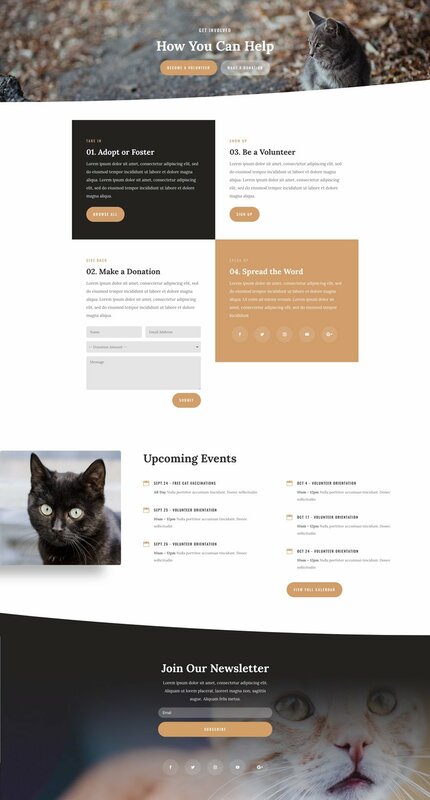 The landing page and home page feature all the necessities an animal shelter may need, including featured animals, adoption info, events, and clear calls to action. The Listings page is organized effeciently with all kinds of helpful info in one place. And don’t miss the Get Involved page which clearly walks the user through the process. This Animal Shelter layout pack is designed to be captivating. The images are an obvious treasure. And the colors are soft and warm which is perfect for an animal shelter. The layouts are packed with calls to action without overwhelming the user which is hard to do but necessary for a website that offer so much. The unique layout of the Listings page is definitely a standout with the use of an accordion for FAQs and a sidebar column using blurbs for quick links. The concise use of tabs to organize pet information on the single listing page is a nice touch. And it is always a bonus to have custom icons specific for an animal shelter to use throughout. To access your new layout, simply activate the Visual Builder when editing a page and look for the “Load From Library” icon in the page settings bar (it looks like a plus symbol). Click this icon to launch the Load From Library popup. Under the Premade Layouts tab, you can easily find the new layout by scrolling through the list of layout packs. Once you find the Animal Shelter Layout Pack, click on it. You will see all the individual layouts included in the pack. Select the layout you want for to use and then click the “Use This Layout” button. Nice shots of the animals. Why don’t you create some useful layouts which will help web designers? Like packers and movers layout, electrician layout, grocery store layout, etc. 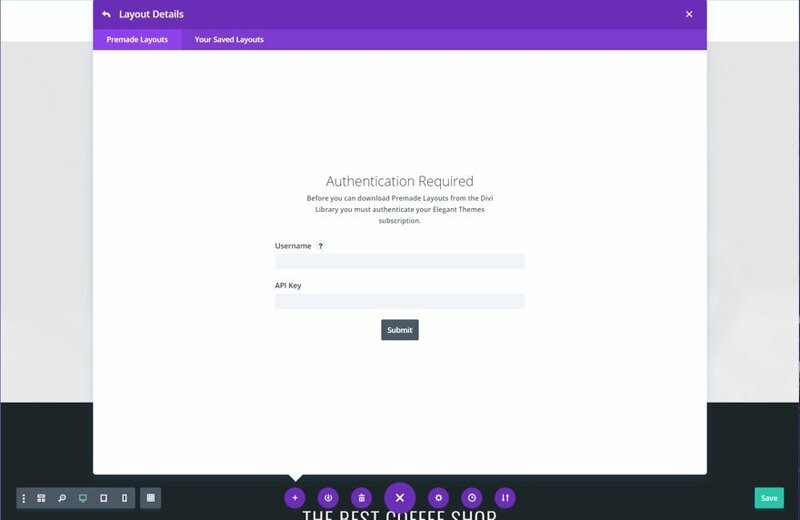 I think part of the reason for creating these layouts is to show what is possible with Divi. You could easily take any of the layout packs, swap out the images and use it for a different industry. I have done that many times. However they are more of a demo and inspiration source as to how the individual modules can be customised and adapted to suite your content. This is useful to the animals that will be helped by these shelters! Many nonprofits don’t have the resources to purchase customized themes. I think it’s great that Elegant Themes is offering this for free to Divi subscribers! This layout is “useful” if it helps a shelter or non-profit animal group save animals. Animal welfare groups often don’t have the money/resources to purchase custom website themes. 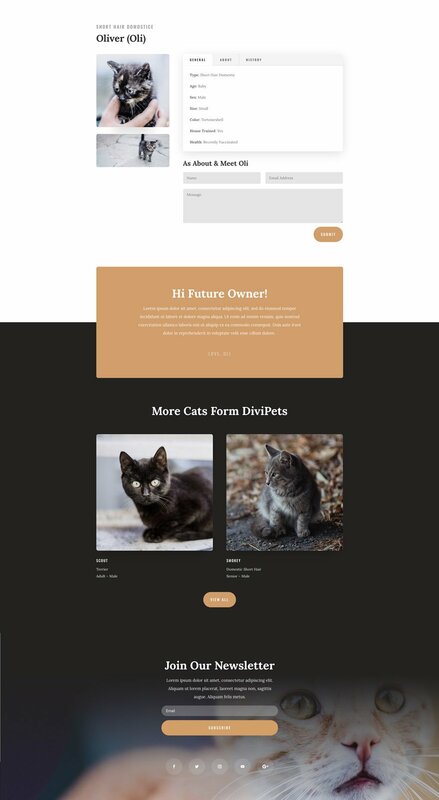 This free layout is an amazing contribution from Elegant Themes that could make a real difference in the lives of people and animals. Really nice layout…And to previous comments- this is an extremely useful layout. Not all clients are movers and electricians. With a few slight modifications and a plugin or two and this is an excellent community organization, nonprofit, fundraising layout. Thanks Divi. Very nice Layout Design, But You already had that layout up there last week. I think you guys are doing an awesome job. Keep up the good work. Keep those new Web design is coming. Thank you for doubling down on design, and your time and effort. Just what I need for a freebie job. Guess we can use the images without issue too? Yep, images are free to use. Thanks, Jason! I know the perfect job where I can use this as a whole template, and there are a couple of sections I can use as additions to a few other existing websites that I’m overhauling. I agree with the other comments regarding the animal pics; they’re just so damn cute. The awesome thing about being a creative web designer is that one can take these layout packs and use them as a base for any project. If it’s meant for a animal shelter, a makeup store, whatever, changing around the images, color palette, etc can turn it into whatever you want. I particularly like the Upcoming Events sections. I see this is currently a blurb section however perhaps a feature on how to implement this with one of the popular events plugins might be an idea. 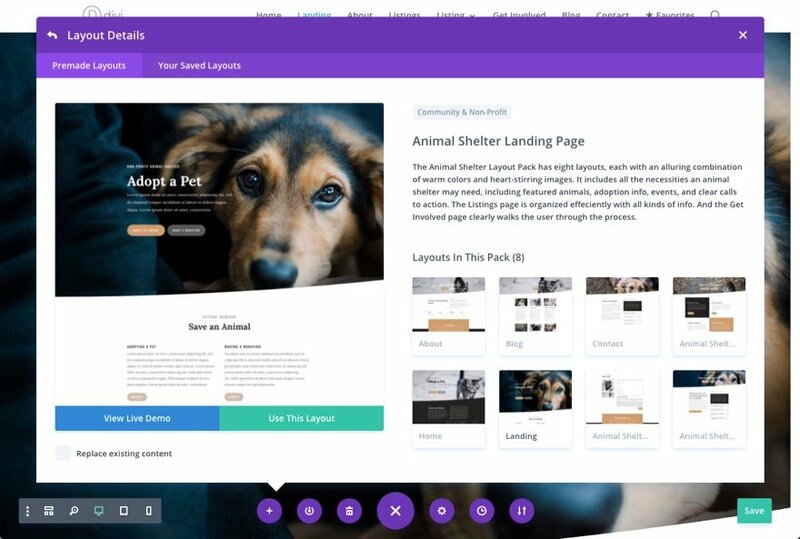 I definitely do not want to dog on the animal shelter layout pack (pun intended), I understand the concept of creating an inspiring layout pack that can be used for different applications, and I don’t want to come off as ungrateful, but I would agree that Sarah (above) has a point. Are there any plans to create layout packs that would be of greater value for Divi web designers? It seems like web designers get a lot more non-profits, PT clinics, dental services, restaurants, etc., than babysitters, animal shelters, etc. To me, it seems like this is a question of “good”, “better”, and “best” use of ET’s time. I think many will agree, the Templates are nice I’ve used some to get an understanding of how you did something with the margins or padding. Outside of that I rarely use Divi layouts due to the fact there bit unusable for a real clients project. Most of modules and theme customizer are just too out of date at the moment and require a fair amount of custom CSS to get them to where they need to be. Can we have a free martial art layout pack, please ? Only 1 layout pack per week and put the other resources into creating library items for modules & sections that can be downloaded the same way. A larger set of icons for one profession at a time – having those resources to download (ai/eps) and edit would be very useful as you could then create your own in the same style if needed. É verdade. Sinto muita falta do ai/eps para editar certos recursos apresentados no tema. Como vem em forma de imagens, nem sempre podemos aproveitar no nosso site, pela diferença de cores, principalmente. This is a perfect opportunity to do some PR and community giving. 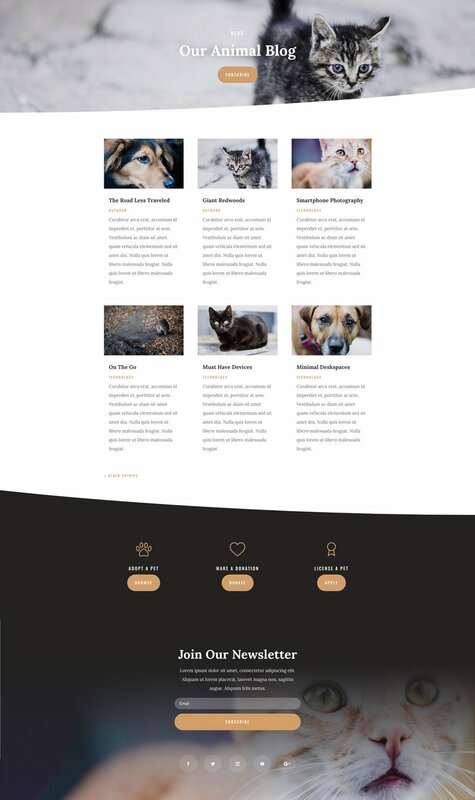 For website designers, I would suggest doing a website for free to an animal shelter that needs a website to display their animals that need homes and for fundraising purposes. This is exactly what I am going to do, I just need to find an animal shelter that needs this done. Thanks for the design, very well done. I tried to download the pack but even if i’m logged in and have the lifetime subscription, i have to click the Join to download button and get to the rate page. How can i download the pack ? I gotta say, this is one of the most beautiful layouts you’ve done. Great job, folks.